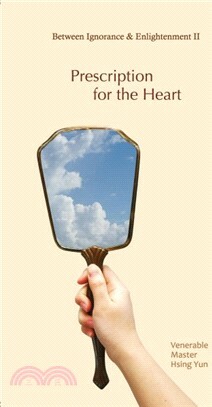 Prescription for the Heart is an inspiring collection of articles by Venerable Master Hsing Yun. He offers us a wide array of topics concerning our daily life, ranging from good health and longevity, the four seasons, advertising, gossip, and extramarital affairs. Venerable Master Hsing Yun offers us hope and practical advice to address our universal problems of living in a contemporary world. He uses down to earth language citing ancient Chinese and Buddhist stories to convey his message. He urges us to take the “middle path” in life, avoiding extremes in our thoughts, emotions, and actions, as well as to follow the Buddhist five precepts. We enjoy and spread happiness when we are tolerant and open-minded and “show compassion, kindness, joy, and generosity” to others.